Newsletter 9 – Takebishi OPC data logging software DxpLOGGER – Takebishi Europe B.V.
DxpLOGGER from Takebishi is an OPC compatible data logging software package for equipment data collection and abnormality monitoring. DxpLOGGER Supports logging for a variety of databases, Alarm monitoring, Real time/Historical Trend and a variety of write methods. DxpLOGGER can be used in a wide area of applications like production management, power monitoring, alarm monitoring as well as traceability systems. 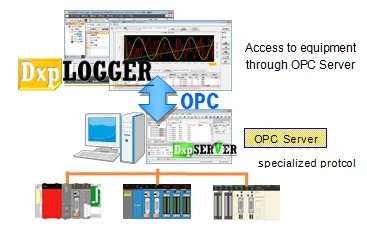 The OPC Industry standard is used for the communication of industrial automation systems and is designed to build up highly flexible systems. With DeviceXPlorer OPC Server you can create a fully scalable and highly reliable data collecting system. 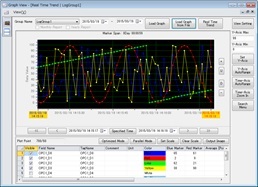 DxpLOGGER provides “Periodic Logging” and “Event logging” which start logging by PLC trigger. DxpLOGGER will log data in 50 millisecond intervals without missing data that changes rapidly. DxpLOGGER’s Time Logging function enables you to make Daily, Monthly and Yearly reports. DxpLOGGER can store to various databases, such as CSV, MS SQL Server, Access, Oracle Database, PostgreSQL, MySQL etc. DxpLOGGER’s write-caching function reduces disk access, and you can automatically delete data that exceeds retention time. With DxpLOGGER you are able to define detailed alarm conditions. The alarm summary displays current alarms and includes filters with alarm levels or group names. DxpLOGGER allows you to avoid unneccessary maintenance by referring to previous alarm occurrences. Historical data such as alarm timings, restore time and the duration are shown in a spread sheet when you specify the calendar date. Specific alarm occurrences can be extracted and exported to CSV or EXCEL. DxpLOGGER allows you to search gathered data by using the calendar and review it in a spread sheet format. Historical data will be shown in chronological order. You can apply multiple filters to focus on the data you need. The logging data can also be exported to CSV or EXCEL. DxpLOGGER can show gathered data as a historical trend graph, so you can check the past status of your manufacturing equipment. With DxpLOGGER you can also monitor logging data in real time. You can set the graph to display different ranges at once. Because DxpLOGGER supports logarithmic graphs, you can see values such as vacuum values and decibels at a glance. With DxpLOGGER you can develop your own programs and run them with specific conditions. You are able to pass string data as argument to the user program. DxpLOGGER enables you to write parts of the data as increment, heartbeat, signal and time data for each interval. In addition, DxpLOGGER supports FTP functionalities.